Lately I’ve been fascinated by what I have to call, thrift store finds. 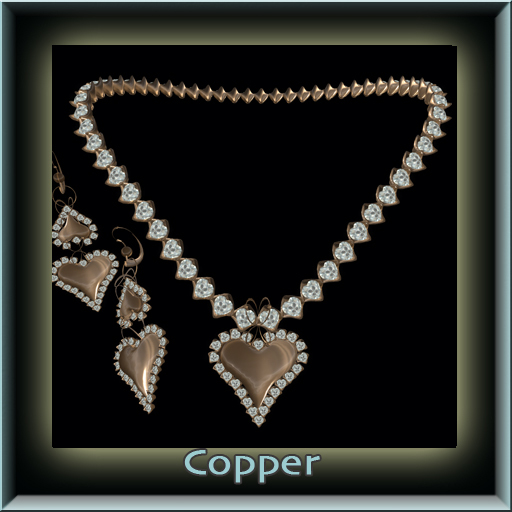 In RL nothing makes me happier then to be rummaging around in a tray full of junk jewelry, digging out interesting old pieces and figuring out what new uses I could put them too. I have a gorgeous marcasite bow pin that my hubby got me as a gift years ago, and I have it pinned to the front of an antique black velvet clutch that I found in such a place. The two pieces work wonderfully together. That has sort of been my thinking process lately, from a creativity perspective. Putting unexpected things together. I picked up this cute dress from &bean and found that it worked really well with the 50L boots from Miel and the purple jeans from SMS that I got a few weeks ago and had no idea what to do with! I’ve paired the whole look with my beloved Elf skin from Curio, my own new hair, called Jill (which sports lots of hair accessories) and my Tortoise shell bangles & earrings set. Worked out nicely, I think! I’m a major goof ball. I was beside myself the other day because I had to work during the Linden Home launch. I was uber jealous of everyone porting around from location to location grabbing good spots! Plurk can be torture sometimes! You see I had to transfer land from my group into tier or something…..gah. Have to log in to do that and I was in a meeting! When I finally managed to log in, I got a good first location – great neighbors! Then I dithered (I am the queen of dithering). I didn’t like the elf house and wanted the hobbit house – plus I was in the middle of the sim – could I potentially get a water front property? Would I really luck out and get on Hethr’s sim??? Egad it was torture. So began the odyssey of trying to find the perfect house location. Erm still looking round, grass is always greener and all that crap. I really want the hobbit house most though. Seriously I should be finishing up my various builds but I can’t be bothered. I’m too busy looking for the perfect house with only 117 prims LOL. 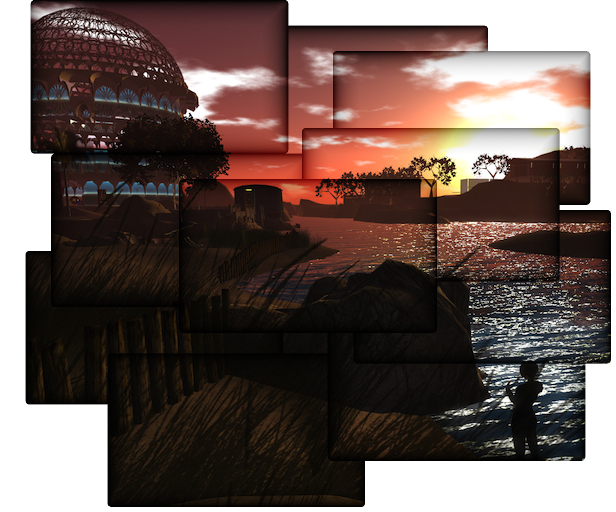 I HAVE 3500 prims on my land, but NO that’s not good enough – I HAVE to have the 117 prim perfect home! Anywho, while recovering from my utter insanity, I decided to do a wee bit of 50L love. I love me some Kyoot and picked up this lovely top (or dress – up to you). I’ve paired with a great old scarf from Artilleri, my new cocoa stained jeans from Surf Shack Co. My lovely Ving boots from Shiny Things – we need new shoes from Shiny Things! I accessorized with my own j’taime earrings and hip hugger belt. Hair is my new hair called Kate in rum raisen and a lovely new skin from Belleza called, Alyson, which has me thinking…fat pack! Oh and also more 50L love – a telescope for my new hobbit hole from Reek! Awesome sauce, 4 prims (which leaves me with 113!!!!) and poses! OMG! I think I need to go meditate. Yes so, released a bunch of hair, did the ultimate crazy in taking down all my old hair (omgomgomg) so now I HAVE to make more so what do I do? I’m going to Disneyland. Okay, not really. 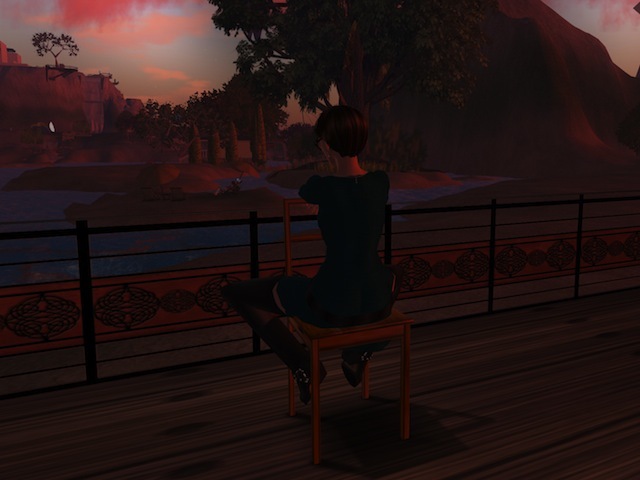 Instead I’m sitting on the back porch of my land, staring at the long abandoned Governor Linden’s mansion in the distance, sadly so outdated in appearance and style as to not be a welcoming beacon to SL. It’s Valentine’s Day and everyone is mooning over their loved one or celebrating Single awareness day. I’m mooning too – my hubby took me out for breakfast cause we are sans kids, a rare V-day for us. I think I fail today at LOTD photos, as you can’t really see my outfit in these photos. I was almost certainly channeling Velma for this look. It’s a cute sweater dress from Sn@tch, my trusty black biker boots from Draw Machine (not to be found in world for some reason ;(….) and one of the new hair styles I released yesterday, called Sabrina. I don’t know why when I head out to take photos in some exotic local, I always end up back in Taber. And the photos are a bit on the dark side. Sorry bout that! I think I’ll try taking more photos when I’m not feeling so pensive. New Hair, New Textures at Dark Mouse! Hi there! So the agony is over, for now. I’ve finally finished three new hairstyles, using my new hair textures! Woot! I’m pretty pleased with how they came out, even if making hair at times is like dragging your fingers across a chalk board for me. Please come and take a look at my new styles, called, Jill, Kate and Sabrina. Jill is an great updo with a complicated hair piece at the back made of faux tortoiseshell, and a head band. Kate is a updo-ish ponytail with lots of wispys. Sabrina is a short cropped hair style that looks like rather studied messiness to me! I have removed all my old hair from the shop. I’ll be slowly either re-doing or re-texturing all of them over time. With the new tones I have new pricing – 5 tones in the same shade for $250L – fat packs will be $600L for 20 shades. If you can’t make up your mind and want a variety of shades, I’ll have one, ‘can’t make up my mind pack.” Please take a look! Here’a teleport to the store! 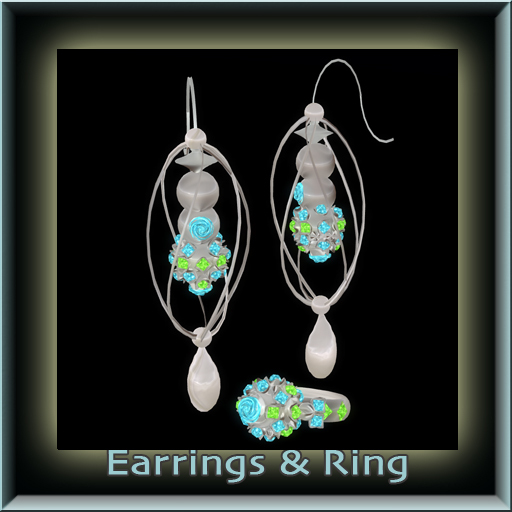 New Releases from Dark Mouse Jewelry at the Artist’s Voice Fair! Well hello there my friends! I’m participating in the Artist’s Voice Fair and invite you to visit my little stall there…and all the other great designers participating. 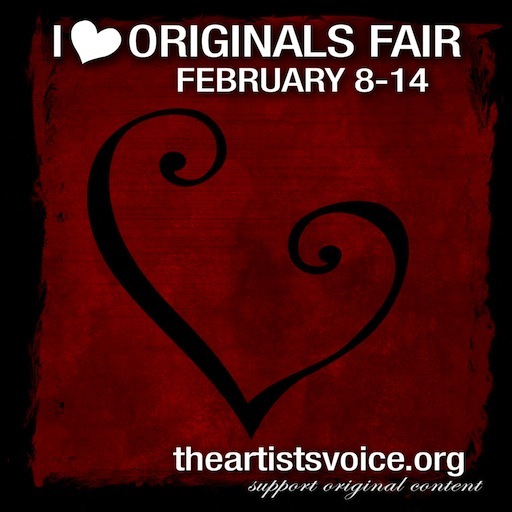 I’m releasing a couple of items exclusively at the fair – just in time for Valentines day. Please visit! 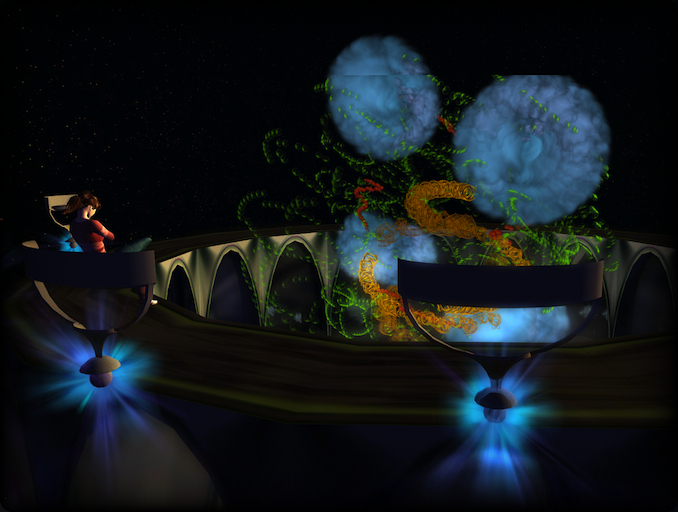 Here’s a slurl to teleport directly to the show! Sometimes I think that I’m a generally clueless maybe even naive person, always caught off guard by the things occurring around me. And now, belatedly saddened by the things occurring around me. I’m troubled by the events of the past few days, alluded to, whispered about, bandied about really – by people who actually know nothing but ‘what they’ve been told.’ If I had a linden for every time in the last few days I’ve seen someone state in that hotbed of intrigue, Plurk, “I heard that this person did this or that” I’d be SLrich. It’s almost impossible to defend ones self against a rumor. There is no proof. There is only, “well my friend such and such told me this or that, and of course I love this person dearly and they’d never lie.” Or, my other favorite generalized statement, ‘this person is crazy (or a moron, or a thief, please fill in the blank. )” Oh rly? I’m still waiting to see the proof of all these various allegations. And so should you before you say more or share the statement with someone else. 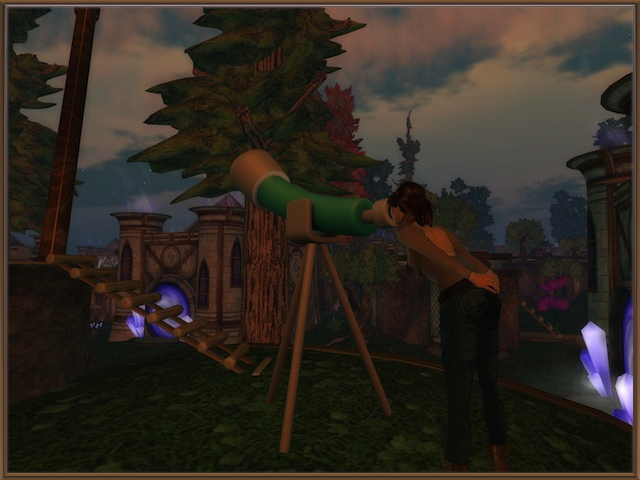 Did you know that there are REAL people in SL? No really it’s true. We’re all anonymous of course. Which is nice. But our very interaction within SL creates a persona, a brand, a reputation that over time, becomes something that we wish to protect. Or, give up on protecting because the pain, anger and sadness of trying to deny a rumor becomes too much. At present I’m sitting in my family room, typing this on my laptop computer while my avatar, or the virtual representation of my REAL SELF, is sitting in the particle lab on Teal. See, here’s the thing, I’m a real person. I have real feelings, I am by turns jealous, angry, and happy, I have faults, habits, and doubts. Oh and I can be hurt. People perhaps criticizing my work, or making denigrating statements about things I like can hurt me, or the people I care about. And I can react in a variety of ways that are available to this virtual world that we live in – I can create a blog post, make a Plurk entry, make a statement in the SLForums, shoot tiny pastes like little atom bombs all over the interwebs, IM everyone on my friends list, etc. about this hurt I have. I can just let it go, if I want. It’s too terribly easy to do this. Over the last few days, I’ve had the opportunity to listen to many, many people, about many, many things, and I’ve been struck by several things. Five different people will perceive the same event in different ways, myself included. I’ve been able to witness first hand, the hurt and pain that can be caused by baseless rumors and innuendo. And I guess I want to say this – Think. Please stop and think about the rumors, the stories you hear. Challenge them. Challenge the person who’s telling it. Ask questions – don’t accept – ask to see the evidence of their statements. Because the truth is this – the next time a rumor runs rampant like a destructive wild fire through peoples lives, it could be you or the people who you love that are burned. And like me, you too could lose a friend. Yes so yesterday on plurk, I rather plaintively asked if I could switch my store decor over to spring. The votes were about 50/50! Any who that got me to thinking – what could I possibly do to cheer myself up and rush the end of Winter. In other news, I decided to open up a satellite shop at the HodgePodge sim. Serindipity? YES! Because the HoPo sim is launching a month long series of events – including a celebration of Summer event. All the vendors will have an exclusive ‘beach’ themed item – including me! 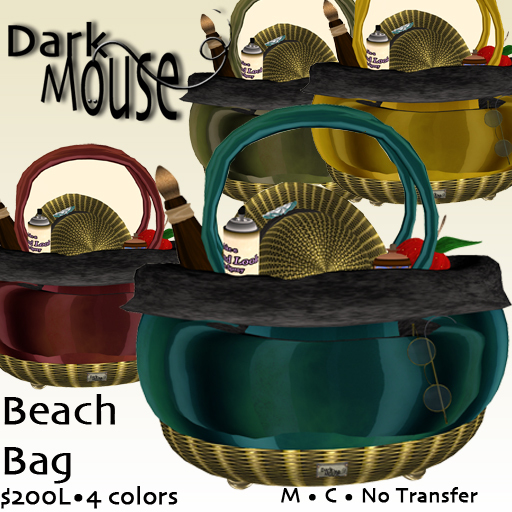 Yes, I was so inspired to bring on Spring/Summer that I created the Dark Mouse Beach Bag. A cute striped bag perfect for a day at the beach – stuffed with all the things you might need at the beach! I decided to feature it with a lovely dress from Artilleri and some smexy sandals from Periquita! Also accessorizing the outfit is my Roses are Blue cocktail ring – but I didn’t want to lose it at the beach, so I hung it on a chain around my neck. Since it’s group gifty time at Dark Mouse (February – YAY) this delicate necklace will be the Dark Mouse group gift! If you’re not in my group – better join today! I plan to send this out to my group tomorrow (to give you time to join and to tell your friends to join!). Remember – I don’t have history on my subscriber kiosk – you have to be in the group at the time that I distribute the gift! So visit my new wee store at HodgePodge Mall to get this lovely beach bag in 4 colors for $200L – exclusively. Here’s a teleport to the new satalite shop. 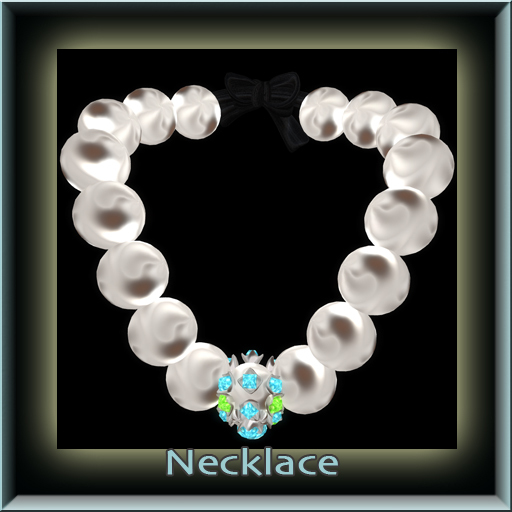 You can join my group there to get the lovely ring necklace too!